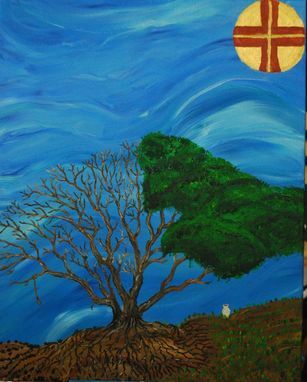 Abstract Painting: "Holy Wednesday: The Tree Of Knowledge Of Good And Evil"
The hymnography of the Orthodox Church on Holy Wednesday focuses on the contrast between Judas, who betrayed Christ for the sake of some coinage, with the sinful woman who poured oil upon the feet of Christ, anointing him. Repentance, is key. The Sinful woman was saved, while unrepentant Judas was not. These themes are especially revealed in a beautiful fashion within the hymn of St. Kassiani, which makes this comparison explicit. 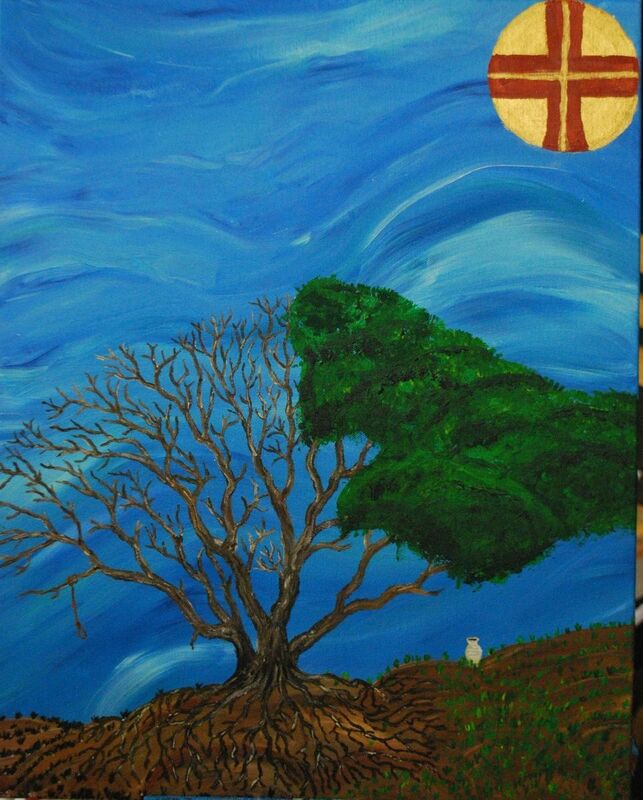 Approaching the manner from the same dichotomy, I've taken the fig tree cursed on Holy Monday, and used it as a foil; on the left, Judas's noose hangs empty from dead branches, while the alabaster jar of ointment used by the woman, has, thanks to her repentance, brought the other half of the tree to life. Sidenote: hidden in the black grass are thirty silver spots; the thirty silver coins.